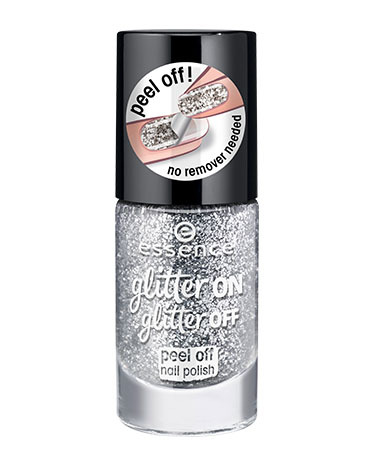 glitter polish has never been so easy - apply 2 coats, let dry, and peel off before your next mani! glitter on glitter off peel off nail polish has a rating of 5.0 stars based on 1 reviews. 01| INGREDIENTS: MEK, PROPYL ACETATE, VA/VINYL CHLORIDE COPOLYMER, POLYETHYLENE TEREPHTHALATE, ADIPIC ACID/NEOPENTYL GLYCOL/TRIMELLITIC ANHYDRIDE COPOLYMER, ACETYL TRIBUTYL CITRATE, SILICA, BUTYL ACETATE, POLYURETHANE-33, CI 77000 (ALUMINUM POWDER). 02| INGREDIENTS: MEK, PROPYL ACETATE, VA/VINYL CHLORIDE COPOLYMER, POLYETHYLENE TEREPHTHALATE, ADIPIC ACID/NEOPENTYL GLYCOL/TRIMELLITIC ANHYDRIDE COPOLYMER, ACETYL TRIBUTYL CITRATE, SILICA, BUTYL ACETATE, POLYURETHANE-33, POLYURETHANE-11, CI 15850 (RED 7), CI 15880 (RED 34), CI 19140 (YELLOW 5), CI 77000 (ALUMINUM POWDER). 03| INGREDIENTS: MEK, PROPYL ACETATE, VA/VINYL CHLORIDE COPOLYMER, POLYETHYLENE TEREPHTHALATE, ADIPIC ACID/NEOPENTYL GLYCOL/TRIMELLITIC ANHYDRIDE COPOLYMER, ACETYL TRIBUTYL CITRATE, SILICA, BUTYL ACETATE, POLYURETHANE-33, POLYURETHANE-11, CI 15850 (RED 7), CI 19140 (YELLOW 5), CI 77000 (ALUMINUM POWDER), CI 77510 (FERRIC AMMONIUM FERROCYANIDE). 04| INGREDIENTS: MEK, PROPYL ACETATE, VA/VINYL CHLORIDE COPOLYMER, POLYETHYLENE TEREPHTHALATE, ADIPIC ACID/NEOPENTYL GLYCOL/TRIMELLITIC ANHYDRIDE COPOLYMER, ACETYL TRIBUTYL CITRATE, SILICA, BUTYL ACETATE, POLYURETHANE-33, POLYURETHANE-11, CI 15850 (RED 7), CI 77000 (ALUMINUM POWDER), CI 77510 (FERRIC AMMONIUM FERROCYANIDE). 05| INGREDIENTS: MEK, PROPYL ACETATE, VA/VINYL CHLORIDE COPOLYMER, ADIPIC ACID/NEOPENTYL GLYCOL/TRIMELLITIC ANHYDRIDE COPOLYMER, POLYETHYLENE TEREPHTHALATE, ACETYL TRIBUTYL CITRATE, SILICA, BUTYL ACETATE, POLYURETHANE-11, CI 15850 (RED 7), CI 77000 (ALUMINUM POWDER), CI 77510 (FERRIC AMMONIUM FERROCYANIDE). 06| INGREDIENTS: MEK, PROPYL ACETATE, VA/VINYL CHLORIDE COPOLYMER, ADIPIC ACID/NEOPENTYL GLYCOL/TRIMELLITIC ANHYDRIDE COPOLYMER, POLYETHYLENE TEREPHTHALATE, ACETYL TRIBUTYL CITRATE, SILICA, BUTYL ACETATE, POLYURETHANE-33, POLYURETHANE-11, CI 19140 (YELLOW 5), CI 77000 (ALUMINUM POWDER), CI 77510 (FERRIC AMMONIUM FERROCYANIDE).